Biblio File: Turning Kids onto Great Books. So, today, as you are hopefully aware, is Talk Like a Pirate Day. When being told of this, the kids today wanted pirate books. I was more than happy to oblige. It reminded me of a great day with the same bunch of kids when I was wearing my Babymouse t-shirt. Girl 1 (age 8): Miss Jennie, what's that on your shirt? Girl 2 (age 8): Miss Jennie, what's Babymouse? Me: You guys have never read Babymouse? Girls 1 and 2: Uh-uh. Me: Come with me! You'll love it! Boy 1 (age 7. Very macho): Miss Jennie! I want that pink book that everyone else is reading!!!! Sometimes, peer pressure is a force for good. Here's a vacation photo of me (looking a little demented-- can we blame that on the sun? Look how burned I got that morning!) 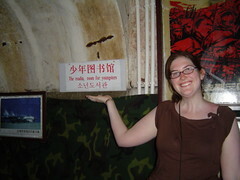 in front of the "Reading Room for Youngsters" in the Beijing Underground City. When China feared nuclear war with the Soviet Union, they didn't build bomb shelters in their elementary schools and backyards. They built and entire underground city-- a series of rooms and tunnels that could house 300,000 people. It has tunnels leading the Great Wall and the Forbidden City, ventilation shafts, and parts can be sealed off in case of contamination. And now, for 20 yuan (about $2.56 US) you can have an English-language guided tour. Very, very cool. There was also a Battle Field Library and a Recreation Room of Old Persons. Also, I'm at Geek Buffet today, blogging about being an adult, your inner child, and the amount of sugary cereal in my pantry. Violet Bing does not like change, or things that are not exactly just so. As such, she has refused to go on vacation with her family and is shipped off to spend some time with her great-aunt Astrid instead. Violet thinks she likes her sandwiches with white bread that is nice and soft. She likes them to have the smooth kind of peanut butter and not too much of it, and her jelly must be grape because sometimes strawberry as pieces of strawberry in it. And also, along with not being all that good at ride a bicycle, she can't swim because she does not want to put her face in the water. Putting her face in the water seems like a bad idea because you cannot breathe while your face is in the water. And so Violet uses her catch-all excuse that she just doesn't have the time. It's a nice little story about a getting a girl to try new things. Really though, it's Paros's illustrations that make the book for me. Line drawings, sometimes labeled, and Violet in her triangle dress add much to the enjoyment of this story. This is quite a nice little book of Snicket's bon mots. Kinda like a depressing Deep Thoughts. Or cross-stitch samplers for the demented. As I'm sure you know, the key to good eavesdropping is not getting caught. A fun tie-in for fans of Snicket. I am jealous that you have a Babymouse t-shirt and also that you have enough copies to hand out. With my sad budget, I have one copy of each and they're always out. That said, it's rare I have that many on the shelf. What I love most is that he had no idea what the pink book was about. Just that it was pink and everyone was reading it but him. Oh! And if you follow the link, you can get your own Babymouse t-shirt. There's a good selection of them. When do you think I can start wearing my Harry Potter shirt again? It voices my opinion on Snape, and if I wear it, people will know I'm right. Have I moved passed the spoiler time yet? Hey, Jennie, can you contact me? 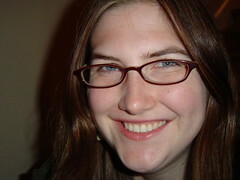 It's about the Cybils - I'm the coordinator for n/f MG/YA, and Kelly asked me to get in touch with you. Thanks! I'm at books@jkrconsult.com. I have a couple of Seuss ones and a Wild Things One, but Babymouse would be fun, too, so thank you for the link! I have passed the spoiler point and I've seen said Snape shirt online. I was one of the ones who did not, I'm sad to say. The Snape shirt was great before the book came out. None of the kids trusted him and it started some *excellent* conversations with library patrons of all ages. But now the book has come out... if I'm wearing the shirt, they'll know I was right, right?